African queen crooner Tuface Idibia has launched a peace initiative through his new award programme tagged 2face Peace Awards. The 6 million naira award is aimed at promoting peace and supporting young Nigerians involved in peace projects in their communities. 6. Mediation directed at reducing violence against women and girls. N1million cash award would be presented to each winner. They will have the opportunity to attend key global peace summits and exchange programmes in 2014. 2Face will mentor the winners and also assist them in sourcing for funds. Also read his words below according to Nation Online. Idibia said that almost a quarter of the world lived in areas affected by military or civil conflicts. He, however, noted that there were young people who were busy building bridges across communities. “These young people are mostly unnoticed but you will find them working hard in various places, educating people and helping to manage conflicts and promoting peace. “They have become community leaders in peace building, reconciliation and post -conflict reconstruction, thereby establishing themselves as the next generation of leaders. “As we march towards Nigeria’s centenary celebrations in 2014, more than anything else, we choose to celebrate these young unsung heroes, who are active in their communities, promoting peace. 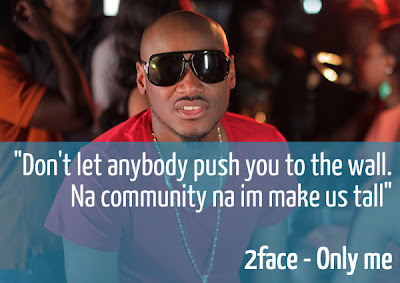 “We want to celebrate them through the ‘2face Peace Awards’’, ‘’ Idibia told NAN. The award judges would assess applicants, based on impact of their projects, innovativeness and sustainability overtime. The winners will be announced during the UN Peace Day event, scheduled for September 21. This is indeed a great initiative. smart move brother another trick to reach climax. No b small tin wise move men..
What Mr. Idibia is currently doing is what we call human capital formation and thats what we also do. Thanks for helping our government to do their work because whom much is given, much is expected; but they have not done what they are expected to do (the government). For once in 2baba’s life, he has done sth worthwhile. Marriage is beginning to knock some sense into him. Though I don’t tink he’s doing dis out of goodwill. It’s a cheap publicity stunt. His popularity has diminished considerably, he’ll do anytin to get back his lost glory. Well, d sooner he realizes dat his stupid peace initiative won’t boost his popularity, d better for him. Personally, I tink he’s a bad role model, having manufactured dozens of babies out of wedlook. Here they come again in a cammoflaging platform. Definately, a leave does not fall 4rm a tree without a reason behind it. Dis so called celebrities and the likes, av devised another means of getting their way 2d top in order 4dem 2stand up one day and say ”i want 2 rule my country, vote 4me!”. Dis is vividly a trick of deception, and shld not be accepted or tolerated! It is actually, one of d vices dat illuminati also has imbibed, to rule d world. My fellow citizens, d End Time has started & d coming of our Lord&savior is at hand, BEWARE! We shld be more rooted in d Word of God, & fevent in prayer, den trusting in d Lord; than ever before now. A very well thought out initiative for our country Nigeria. As usual you have set your self apart as the conscience of our nation. You are indeed a great bridge builder; kudos brother and more feathers to your cap. Wow nice move 2face,those unsung heroes nid 2 be appreciated in d society. 2baba u 2much jooo,more blessing bro! his master 2baba u 2much a very good idear if nigeria has more people lik u d country will b a beter place 4 evey body i wish to get ur number my best frnd on air.